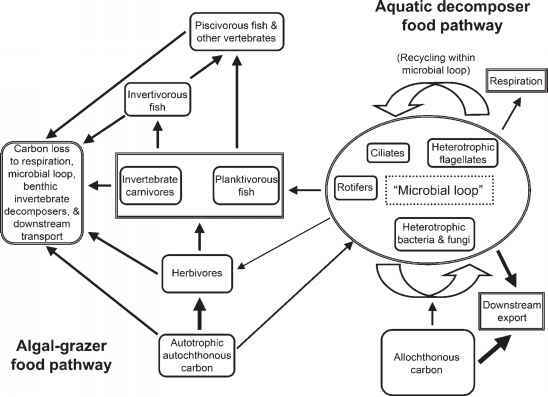 The photosynthetic activities of benthic algae, macrophytes, and phytoplankton contribute the principal autochthonous inputs to lotic ecosystems. Gross primary production (GPP) is the total amount of new C fixed, and net primary production (NPP) is the difference between C fixed by autotrophs and their own metabolic demands. The symbol P introduced earlier and used in the P/R ratio (where R is respiration) is GPP However, it is important to note that R is a measure of respiration of the total community or ecosystem, including both autotrophs and het-erotrophs. Conceptually it is very useful to consider these separately as RA and RH, but in practice this is not feasible. For these reasons, P - R in lotic ecosystems is referred to as NEP, the excess of GPP over ecosystem respiration. Benthic primary production has been estimated for many different stream types from changes in oxygen concentrations, either in enclosed benthic chambers designed to measure benthic primary production, or using open water methods that measure whole-ecosystem production and respiration (Section 6.1.3). Oxygen change in the dark provides an estimate of ecosystem respiration (RA + RH), which can be extrapolated over 24 h (Bott 2006). GPP is estimated by adding respiration during the light to net oxygen change in the light, and NEP is calculated as the difference between GPP and 24 h ecosystem respiration. Values are converted to C using the formula g C = 0.286 x g O2 and reported in g C m2 day1. Benthic chambers are especially useful for measuring local-scale heterogeneity and testing of environmental variables, but are difficult to scale up to the entire ecosystem unless well replicated. In addition, whole-ecosystem estimates are generally higher than chamber estimates (Webster et al. 1995, Mulholland et al. 2001), and current evidence suggests that the whole-ecosystem measures are more reliable. Initially the whole-ecosystem method was used primarily in unshaded, relatively productive systems; but due to improvements in technique (Marzolf et al. 1994, Young and Huryn 1998) it is now being used in smaller, shaded streams where high rates of reaeration and low rates of primary production make measurement more challenging. Owing to the diversity of methods used and the preference of individual investigators to express results as either GPP or NPP, the following discussion will use the term primary production regardless of which is reported; however the symbol P, widely used in discussions of stream ecosystem metabolism, invariably refers to GPP. Benthic primary production is expected to be lower in forested than in open-canopy streams and to increase with stream order as streams widen and are less shaded by riparian vegetation. Using the whole-ecosystem method, Mulholland et al. (2001) determined primary production in eight first- through third-order streams in different biomes of North America. Light levels had the strongest influence over daily P, and for most sites light saturation was observed at levels consistent with chamber studies (Hill et al. 1995), although light saturation at high irradiance was not observed at a desert stream site. In their review of over 60 estimates from stream sites in eastern North America, Webster et al. (1995) found that primary production in forested streams was about half that of open streams, although results were highly variable. As expected, production was low in first- and second-order streams and highest in third-and fourth-order streams, and then declined at higher orders. McTammany et al. (2003) reported a pronounced longitudinal increase in primary production along the Little Tennessee River in North Carolina, including two fourth-order, one fifth-order, and one sixth-order reaches downstream from the intensively studied headwaters in the Coweeta Hydrologic Laboratory. Most studies of GPP and R are of short duration, but measurement of daily rates continuously for 2 years in Walker Branch, Tennessee, provides an unusually detailed view of seasonal patterns and factors controlling stream metabolism (Roberts et al. 2007). This first-order, deciduous forest stream was net heterotrophic throughout the year except during the open-canopy spring, when GPP and ecosystem R were coequal (Figure 12.2). Leaf phenology was the main control of seasonal variation, day-to-day weather variation influenced light availability and GPP, and storms suppressed GPP in spring by scouring algae, but stimulated GPP in the autumn by removing leaf litter and increasing light availability. Daily R was controlled by auto-trophic activity in the spring and allochthonous organic matter inputs from leaf litter in autumn. After an initial decrease following storms, labile organic matter inputs from the surrounding terrestrial system led to a multiday stimulation in R. Thus, variability in ecosystem metabolism was evident on all timescales, and attributable to daily and seasonal influence of light interacting with vegetation, and episodic high flows.